There are just some classic dishes that I’ll never get sick off, and one of them is spaghetti aglio e olio. 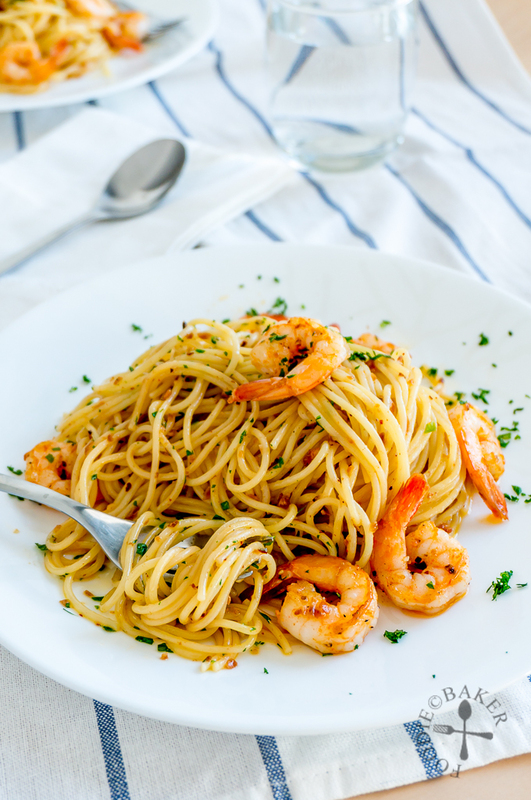 Spaghetti aglio e olio, which means “spaghetti with garlic and oil” in Italian, is a traditional Italian pasta dish originating from Napoli, made by sautéeing minced garlic in olive oil with dried red chili flakes then tossed with al dente spaghetti. 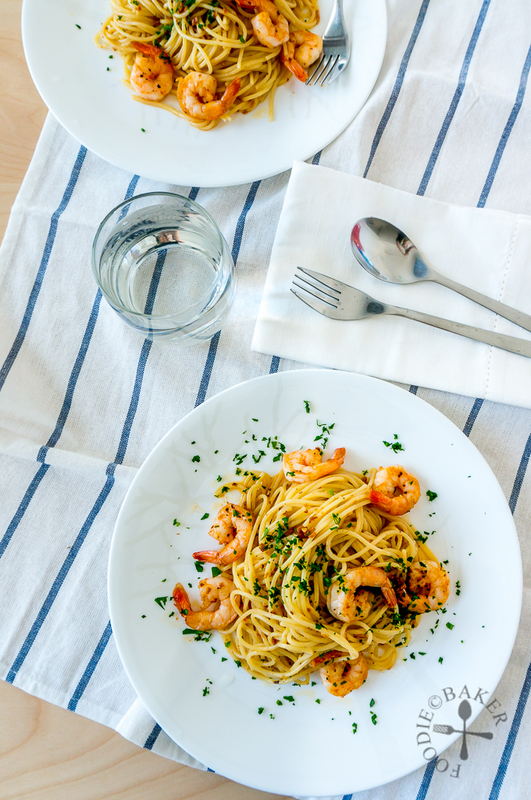 I first made and blogged about this spaghetti aglio e olio with prawns about 5 years ago with no step-by-step photos and end-product photos that will make me cringe whenever I look at them, so I decided it’s time to give it a makeover! Have all your ingredients ready before you start cooking. The dish can be put together in just 10 minutes (don’t count the time waiting for the water to boil), and it must be served immediately. So you may not have the time to mince the garlic when the pasta is cooking (unless you are using a garlic press) or chop the parsley. The water used to cook spaghetti must be well-salted. If the water is under-salted, your pasta will taste bland and adding salt at the end just doesn’t work quite as well. I always use a tablespoon of salt (any fine sea salt or table salt will work) per litre of water. Use a good amount of oil and only extra-virgin olive oil. Too little oil will make your pasta dry and unpalatable while too much oil will make your stomach queasy. I like my spaghetti aglio e olio on the more oily side so I use about 3 to 4 tablespoons of oil per serving of pasta. And lastly, don’t you dare burn the garlic! You can minced or slice the garlic, it’s up to you but I personally prefer using minced garlic. Cook the garlic gently on low heat until they turn golden-brown and add in the al dente spaghetti immediately. 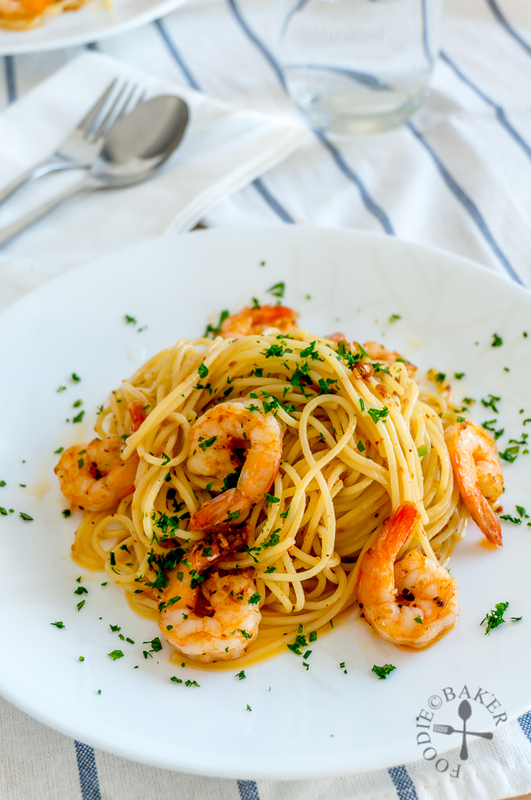 If you see that your pasta won’t be ready by then, remove the garlic from heat when they turn a light golden-brown colour as the garlic will continue to cook in the hot oil. Do you know that you can use the pasta scoop to measure 1 serving of pasta? I usually use 90 grams to 100 grams of pasta per person, and I always measure it with a weighing machine (a bit OCD here oops). But just a few days back I read about this on social media – the hole in the pasta scoop can be used to measure 1 serving of pasta! *mindblown* I’ve always thought the hole is for the pasta water to drain out! 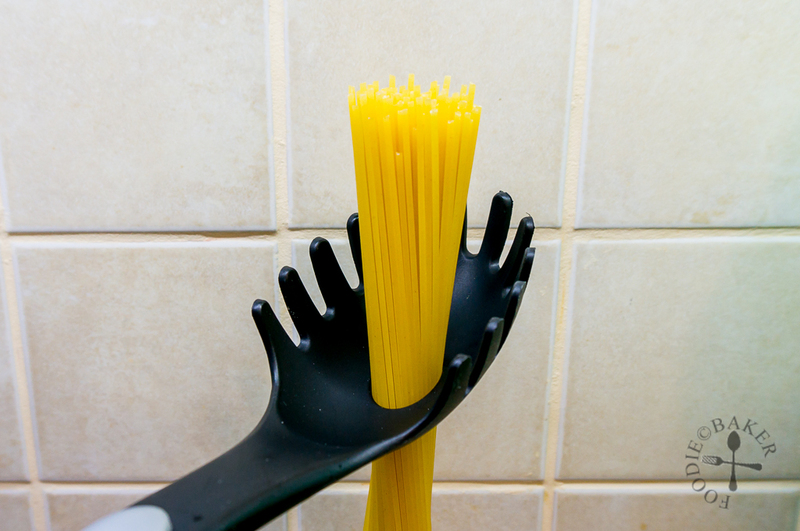 I tried it and it’s true – I got about 100 grams of spaghetti by using this new trick. Now I don’t have to take out my weighing machine in the future anymore when I cook spaghetti! Some say it’s sacrilegious to add cheese into spaghetti aglio e olio but it’s up to personal preference. While I don’t like adding cheese to mine, my friend John from the Bartolini Kitchens, who is an Italian, adds cheese into his. (Do check out his blog for many, many Italian recipes!) Anyway, as this is a seafood pasta, we usually don’t add cheese to it because cheese and seafood don’t go very well together for us. If you had not made spaghetti aglio e olio before at home, I beg you to give this a try – it’s quick and easy (made in less than 30 minutes), delicious and absolutely comforting! Here’s how to make it! Have all your ingredients ready before you start cooking! 1) Season with salt, freshly ground black pepper and, if using, cayenne pepper. 2) Bring a large pot of water to boil. Season the water with 1 tablespoon salt for every litre of water. Add in the pasta, stirring occasionally to prevent the pasta from sticking to each other. 3) Sear the prawns until they are cooked. Remove them and set aside. 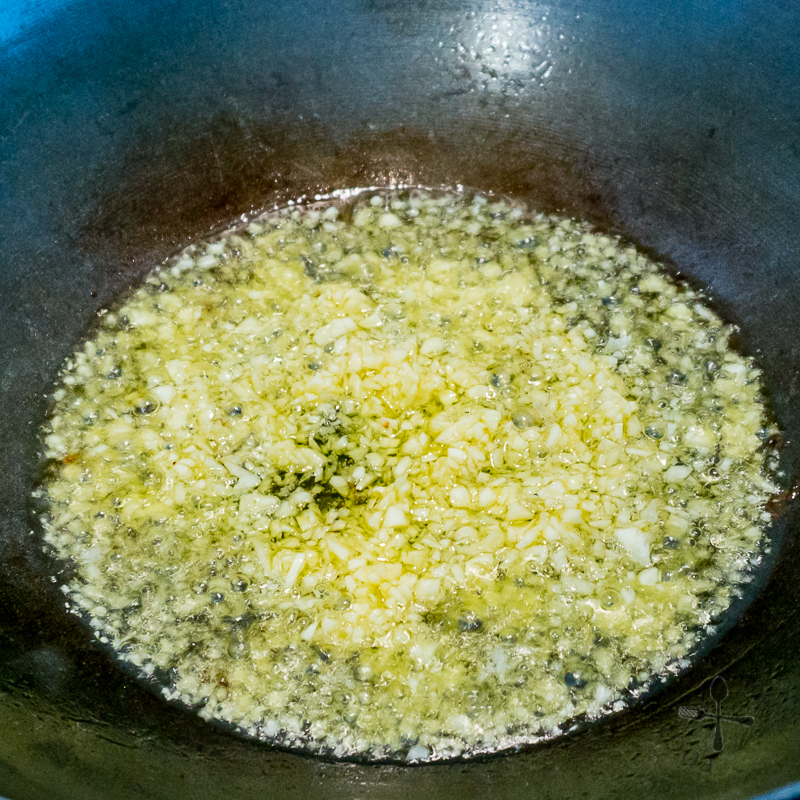 4) Add in remaining oil and cook garlic gently over low heat, stirring frequently so that they cook evenly. 5) Let the garlic turn a light golden brown and remove from heat if the pasta is not ready yet. 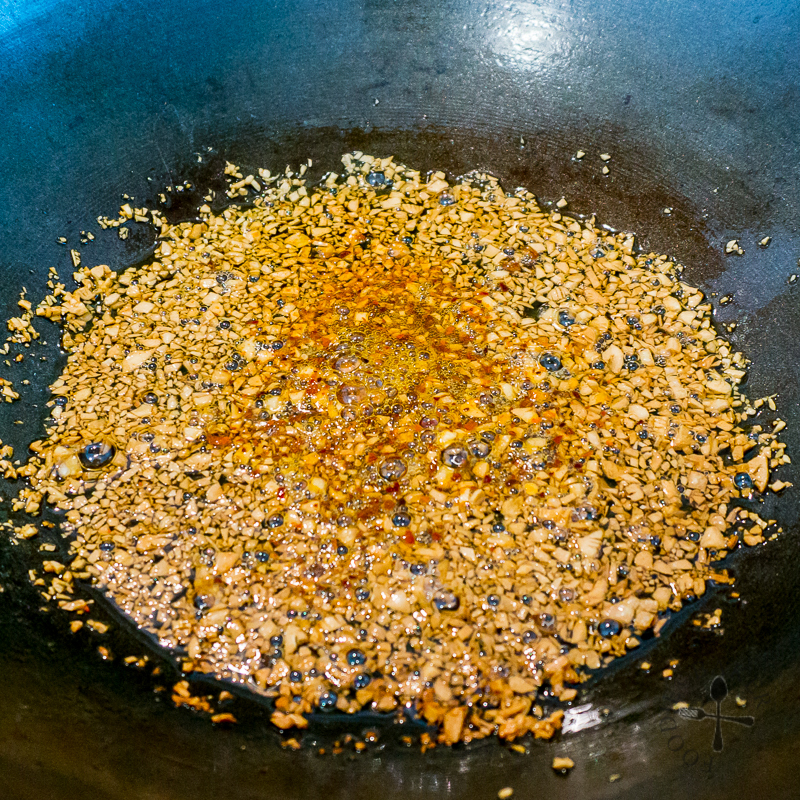 6) The garlic will continue to cook in the hot oil even though the pan has been removed from heat. 7) Drain the pasta and add them directly into the pan. Toss well to mix them together. Remove the prawns' heads and shells (keep them to make stock). De-vein the prawns and place them in a small bowl. Rub in 1 teaspoon salt and set aside for 5 minutes. Rinse the prawns and pat-dry thoroughly with paper towels. Place them in a dry bowl and season with salt, freshly ground black pepper and, if using, cayenne pepper. Set aside. Peel and mince garlic - either with a garlic press or with a knife. Chop up the flat-leaf parsley, if using. Bring a large pot of water to boil. Season the water with 1 tablespoon salt for every litre of water. Meanwhile, have a large frying pan ready. 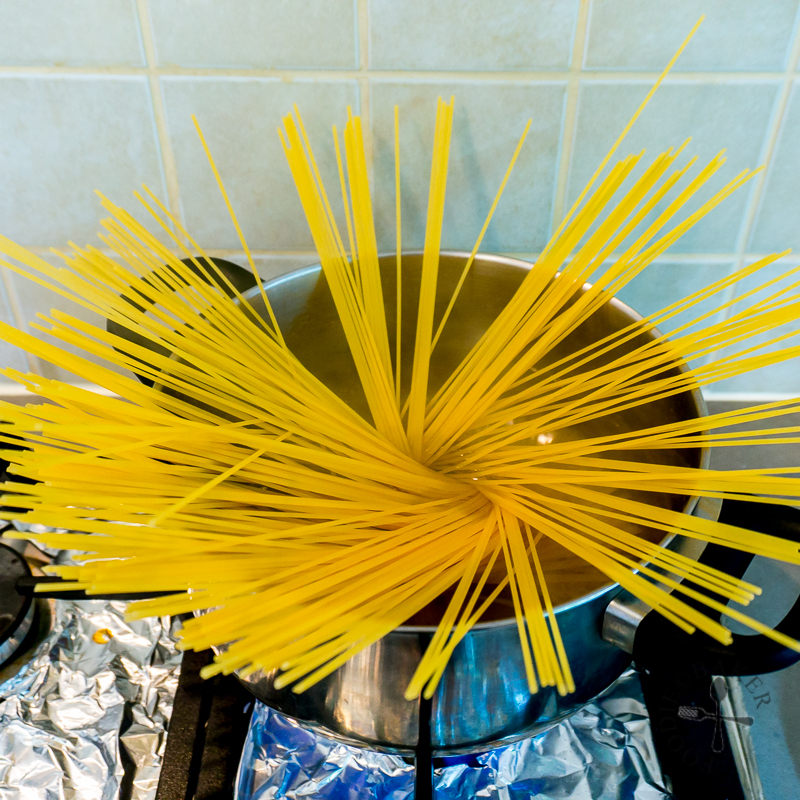 When the water has come to a boil, add in the pasta, stirring occasionally to prevent the pasta from sticking to each other. 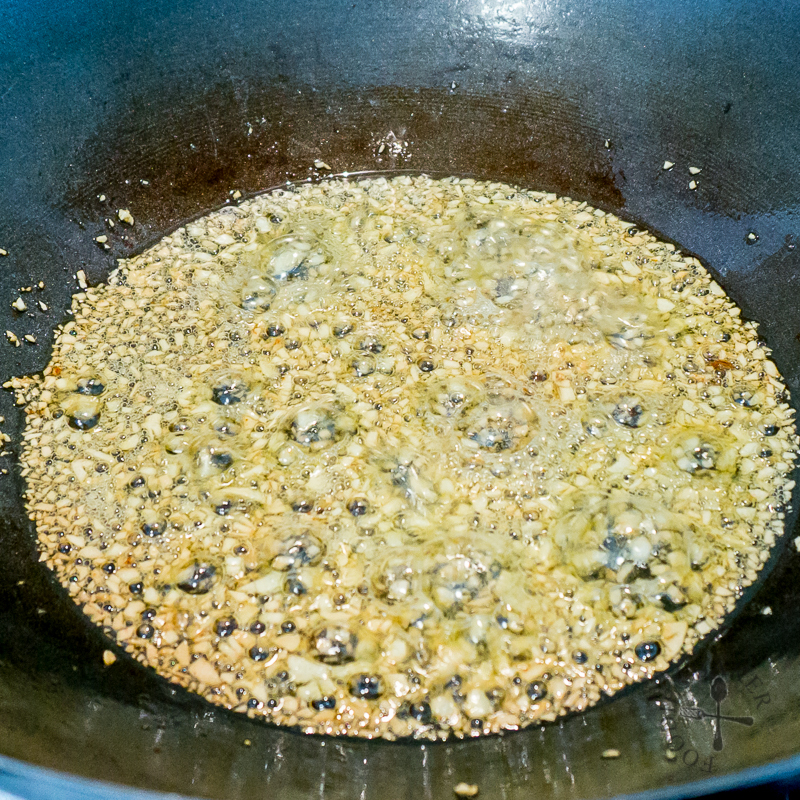 Heat the frying pan over high heat and add in 1 tablespoon of oil. Add in the prawns in a single layer and sear, not touching the prawns at all, until one side is browned. Flip to the other side and sear until the prawns are cooked. 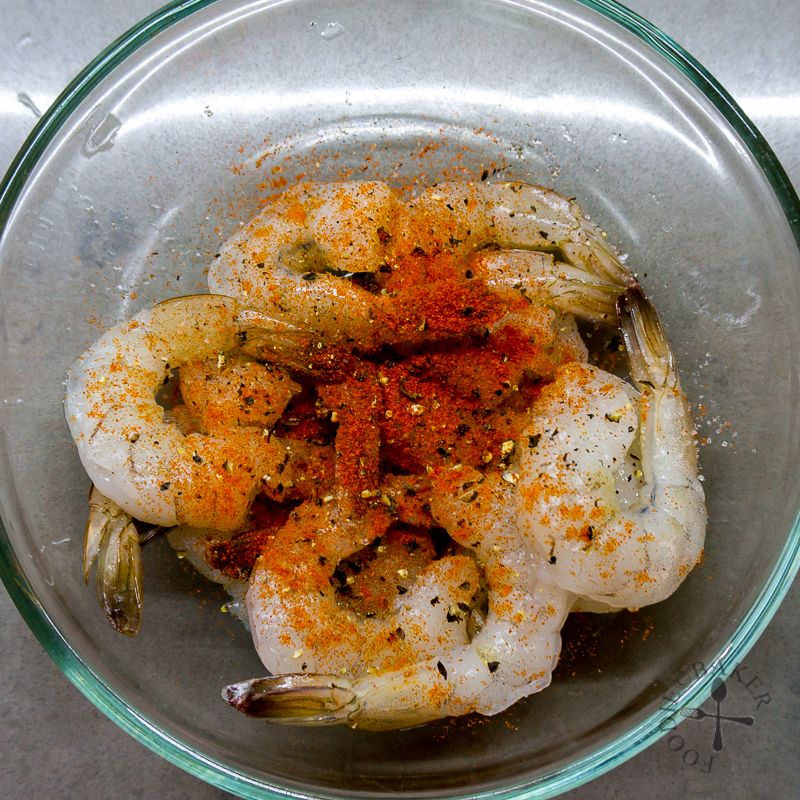 It will take only about 2 to 3 minutes to cook the prawns. 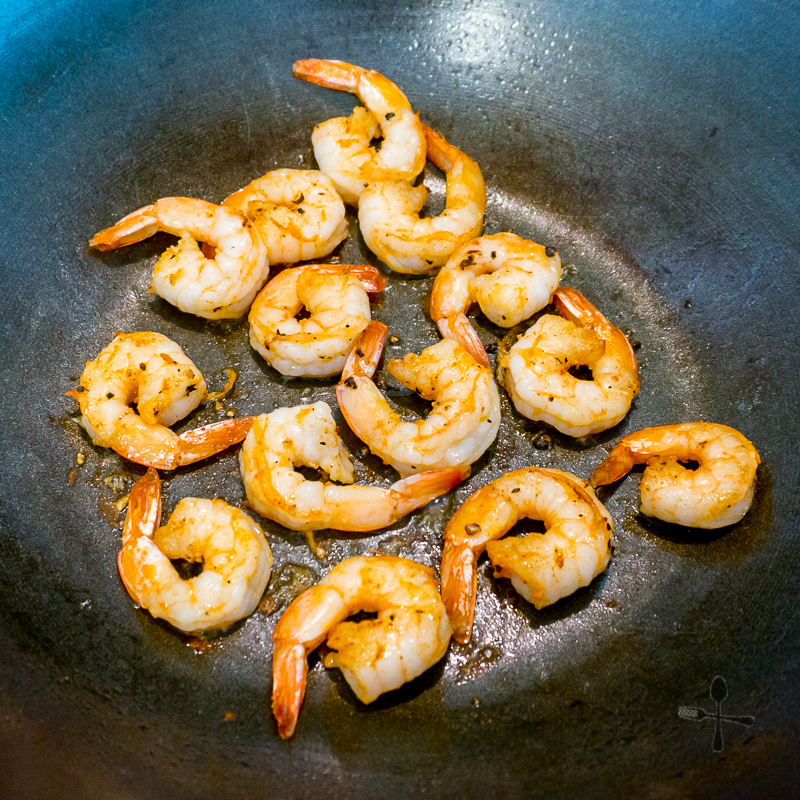 Remove the prawns from the frying pan into a bowl. Lower the heat down to low and add in remaining 5 or 7 tablespoons of oil. Add in the minced garlic and stir frequently so that they cook evenly. Let the garlic turn into a light golden-brown then add in the chili flakes. If your pasta is not ready, remove from heat as the garlic will continue to cook in the hot oil even though the pan has been removed from heat. If the pasta is ready, let the garlic cook until they turn slightly darker in colour. When the pasta is al dente, drain the pasta and, without rinsing the pasta, add them directly into the pan of garlic. There's no need to drain the pasta too thoroughly as you want to add some pasta water into the pan as well. 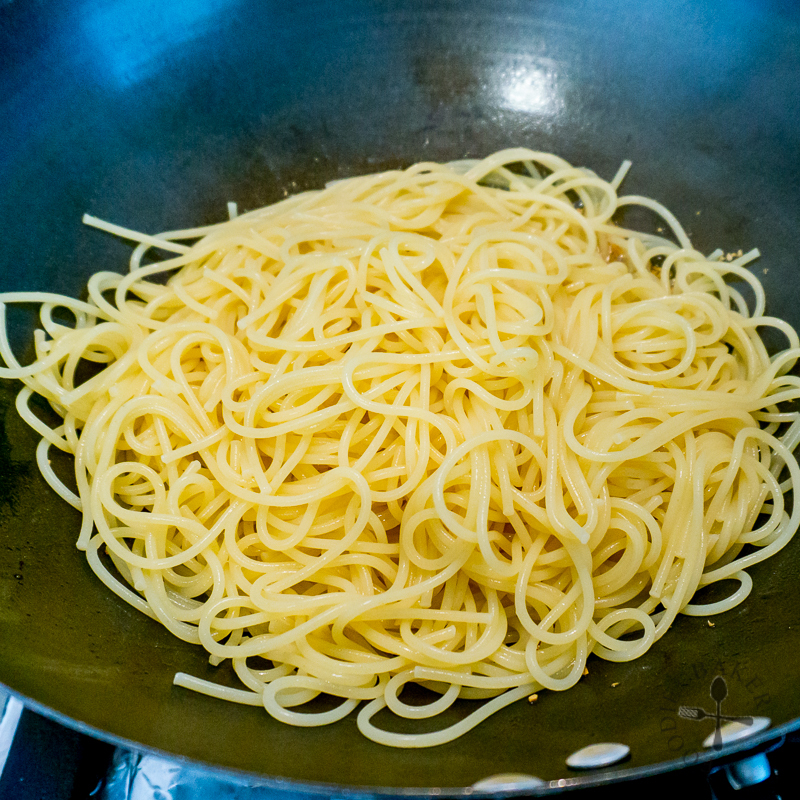 If you have removed the frying pan from heat, return the frying pan back on high heat and toss everything together until the pasta is well-coated with oil. 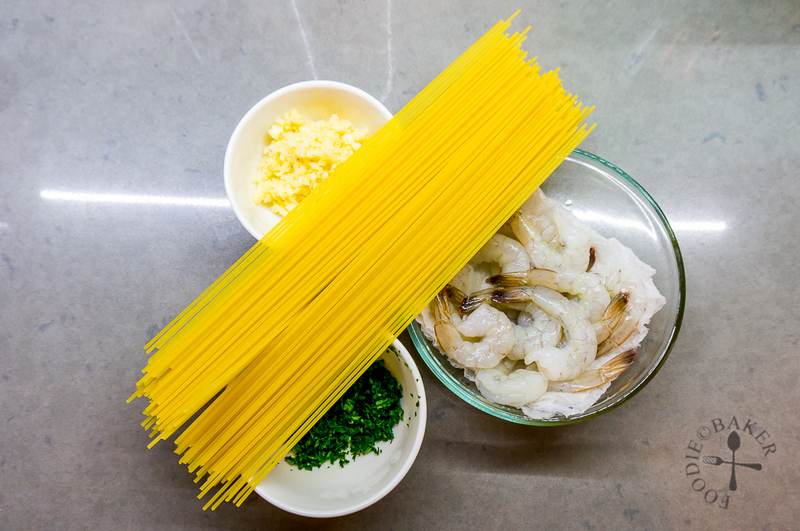 Divide the pasta between 2 serving plates and place the prawns on top. Garnish with flat-leaf parsley, if using, and serve immediately with extra chili flakes on the side. - The best scenario is for the garlic and pasta to be ready at the same time but it's not always the case. Just make this dish more often and you will definitely get the hang of it! - You can substitute dried chili flakes with bird's eye chili. Haha neither do I until a few weeks back! Simple yet so delicious! I can almost smell the aroma from the fried garlic! 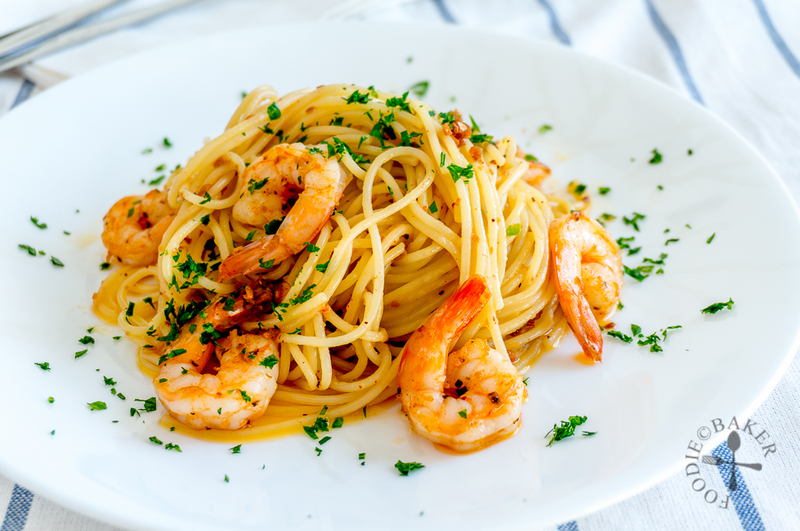 This plate is perfect for us, we all love prawns, look delicious !! !